5. Self propelled - any questions? 1. Your choice of stylish colors. Pros: Low cost versions available, great for mowing small or large yards, easy to maneuver around landscaping obstacles such as trees. Cons: Regular maintenance required, need to store fuel for use. Features available: Rear or side bagging, mulching, self propel, electric start, aluminum or steel decks, blade clutches. Now for the lawn mower reviews! The rotary lawn mower is an American standard. First introduced in the late 1960’s, the walk behind mower soon became a classic. The rotary mower was able to cut grass and weeds better than the reel-type mowers they replaced. Grass clippings could be cut several times by the mower blade before the clippings were discharged from the deck. Mulching was born! The light weight and low cost of these mowers made is very popular with those moving to the sprawling suburbs with their large lawns. Over time, more features were added, to make the engines easier to start. Self propelled models were introduced, and safety features such as blade brakes were made standard. The modern machines are easier to start, more durable, and more stylish than ever before. The art of lawn mower reviews was born. Engine Types. 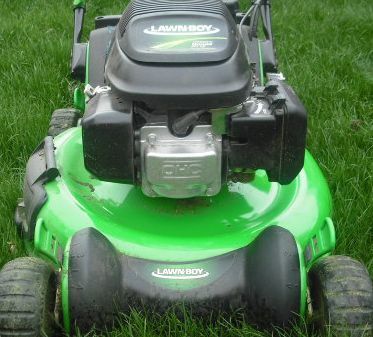 Lawn mower engines are nearly always 4 stroke engines ( sometimes known as 4 cycle engines). This means there is an oil reservoir in the bottom of the engine which provides lubrication for the engine. This oil becomes dirty over time, and should be changed about once a year. In years past, some mowers were equipped with a 2 stroke engine, meaning oil had to be mixed with the gas. Due to exhaust emission concerns, these engines are seldom used any more. Four stroke engines have either a side valve or overhead valve ( OHV) design. Honda pioneered the use of overhead valve engines on lawn mowers, and today most major manufacturers offer at least one overhead valve engine. Overhead valve engines provide more power and fuel economy than a regular side valve engine. Since the engine is more complicated, the price is usually higher. Look for overhead valve engines on the more expensive mower models. Deck configurations. This refers to how the mower deck is shaped, and how the mower deals with the grass clipping is produces. The most popular design in the rear bagger , which discharges the grass clippings to the rear and stores them in a large bag situated within the handle. Mulching mowers recycle the grass clippings by cutting and re cutting them into small pieces which are allowed to fall back into the lawn. Over time, the clippings decompose and add nutrients to the lawn. Side discharge decks allow the grass clippings to be tossed to the side of the mower. This is typically used when the appearance of the clippings on the lawn is not a factor. Most mowers have the ‘3 in 1’ option , which allows the operator to rear bag, mulch, or side discharge, depending on the conditions present. Deck materials. Lawn mower decks are made of either stamped steel or cast aluminum . In many cases, the cast aluminum decks are found on the more expensive machines. Since aluminum does not rust like steel, these decks last decades without worries about corrosion. All steel decks are not created equal. Some stamped steel decks are made from thin steel, which bends and cracks easily. The premium steel decks are much thicker, and coated with durable paint that resists rust for decades. Self propel. Having a mower that moves all by itself is a grand idea - especially if you are bagging the grass, since the mower will become heavier as the grass catcher fills up! Self propel mowers may be single speed or variable speed. Some variable speed mowers adjust their speed to the pace the operator is walking, up to a maximum of about 4 MPH. Many mower brands offer either front wheel drive or rear wheel drive. There is no clear advantage to either, although the premium mowers seem to favor rear wheel drive. Most lawn mower reviews discuss this important feature. “Blade brake versus blade clutch.”Since the mid 1980’s all mowers produced in the United States are required to have a mechanism in place to stop the rotating blade within seconds after the handle has been released by the operator. This is to help prevent hand injuries caused by reaching under the deck while the blade is turning. Modern lawn mowers provide 2 options to get this done. The most popular method ( and least expensive) is to switch the engine off while a brake is applied stop the engine (blade brake system) . This requires the engine to be started every time the handle is released. The second method allows the engine to continue running while the blade is either engaged or disengaged by the operator (blade clutch system) . Fitting a mower with a blade clutch can be an expensive proposition, so this is an option found on more expensive models. It has the advantage of fewer engine starts while mowing the lawn, since the engine is not stopped when the handle is released. Lawn mower reviews. Now that the basics of lawn mower design have been covered, it is time for lawn mower reviews. All the major brands are represented. Just click on the mower brand you are interested in to learn more.